France is always fascinating. 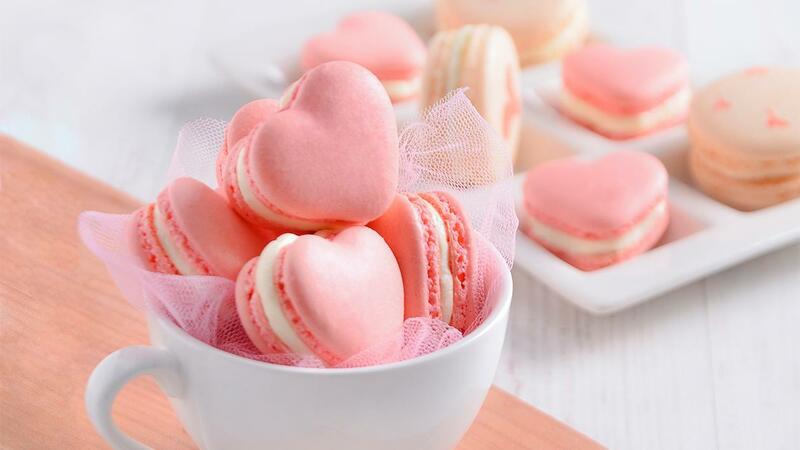 When French Macaron is served, it will become good cookies to warm the atmosphere. Combining with lemon in soft cream in the middle, it will spoil all cookies lovers. Whisk the egg white and cream of tartar until they are getting bubbly. Then, add the sugar and whisk until medium peak. Sieve the icing sugar and almond powder and add into the whisked egg gradually. Mix them well until they reach the dough consistency like as flowing lava. Add food coloring as you wish. Pipe the dough in heart form and put and arrange them in a pan that was covered by parchment paper. Stamp the pan to let out the air bubbles. Set it aside in 30 minutes until it is not sticky anymore to touch. Bake at 160°C in 5 minutes and decrease the temperature to 150°C. Then bake in 10 minutes. Set it aside on the top of the pan until it is getting cooler. Add lemon butter cream as the filling. Cook all ingredients of lemon syrup well and set it aside. Whisk white shortening and margarine until they expand. Pour the condensed milk, lemon syrup, and lemon essence. Mix them well.